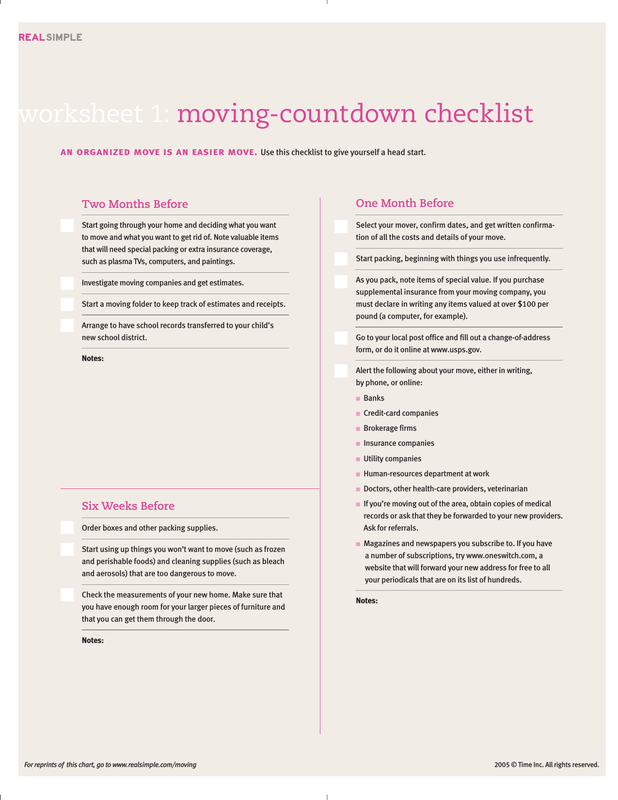 Download the Moving Checklist Template that is designed to keep your move as easy as possible. Use this list to follow closely to be certain that you remember all that needs to be completed for a successful and smooth move. Once you’ve completed each task, check it from your list. If there are added tasks, add them to the notes sections provided. If you plan to use a moving company, this would be the time to begin the process. Research the companies that you will fee comfortable with and acquire estimates. Once you have decided on 3 or 4 use the sheet attached to jot notes and keep information on each company. It’s a good idea to begin a paper file, computer file or both in order to properly track estimates, receipts and paperwork along the way. If you have children, it will be very important to have their records transferred prior to your move. This also would be a good time to arrange this task. Notes – As you begin these processes, if you have questions or need to add tasks, place these things in this notes section for your convenience. This is the time to order and/or purchase packing supplies such as boxes, packing tape, bubble wrap or gather old news papers or tissue paper to cushion your item. You need to acquire measurements of your new home or apartment. Measure doorways especially to be certain you will be able to get larger furniture pieces in the doorways. If not, you may need to plan a day closer to your move to break them down a bit so they will fit through the doorways and in the rooms you would like them to go into. Start packing the items that you use the least such as sets of china, curio cabinets contents, out of season clothing, toys etc. As you are packing, special items that cost over 100.00 per pound, and you are purchasing additional insurance, you will need to make a list of the special items to be insured. Provide a change of address to the postal service, you may get a form at the post office or you may change your information online. www.usps.com – there is a $1.00 charge for this service online. Any papers, periodicals, magazines- contact these companies online or by telephone. If you own a safety deposit box, take a lock box to the bank and place all of your valuables into a secure box that can be placed in your vehicle to take with you. Set aside any items to include valuables that you will transport in your vehicle. Do not send jewelry on board of a moving truck. When your truck shows up, be certain to check the D.O.T. number matches what the company has provided to you. Before the drivers have an opportunity to leave, be certain to sign and collect the inventory list and bill of lading. Do not allow these companies to push or rush you. They are being well paid and are working for you until you are moved.